To profit from your gym membership and run inside, without rain or passing cars? Or to run outside with changing scenery, wind playing in your hair? It’s a choice many face and you’ll always find advantages of one position or the other. So, what are benefits and drawbacks of running on treadmill vs outside? Well, as most things in life, depends on what you are looking for. One thing might be better for your health than other and different people feel more comfortable in different environments. What we did here is assemble some advantages and drawbacks of each choice, and divided them into sections – this way you will be able to choose things that are important for you and make a decision. Or maybe try both! Most people take up running because of all the health benefits it offers. It helps you lose weight, strengthens joints and bones, even reduces your risk of cancer! Despite being healthy overall, there are some particular areas that train better in gym or outdoors. Let’s explore them one by one. It’s easier on your joints. As the running treadmill track is usually cushioned, you’ll experience less joint pain afterwards and reduce the risk of joint problems. More adjustable. If you have some injury or need to work around more risk-prone areas of your body, it’s better to choose an environment you have more control of. Smaller risk of injury. 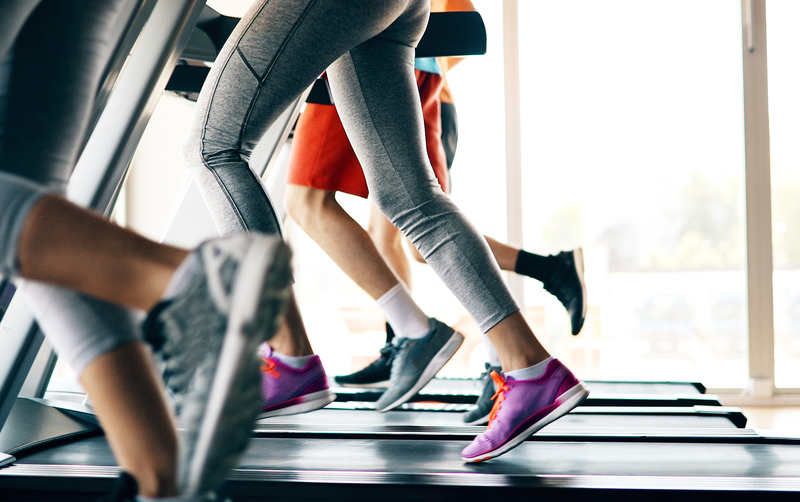 While there are always some treadmill-related injuries, the number is significantly lower than running outside. Besides, there are people at the gym that can help you in that case. Strengthens your bones. Hard surface, such as asphalt, may be harder on your joints, but it provides you with the bone strength you wouldn’t get at the gym. Stimulates more muscles. Uneven terrain that inclines and declines, different turns allow you to train more muscle groups, as well as improve your reaction and agility. Lengthens muscles. Natural environment allows you to run downhill (unlike gym equipment), which makes your muscles lean and strong – just avoid locking your knees and soften the impact when your foot touches the ground! To sum up, while gym allows you to do a more careful exercise, outdoors has more health benefits. Like every exercise, running has its own risks. And sometimes, when you have already taken a challenge (like lose weight or build more muscle), you don’t really want any additional challenges. So, which option is safer? Is it easier to run on a treadmill or outside? Most people feel that with adjustable settings, treadmill is easier to navigate, control the time and intensity of your experience. You won’t meet any unexpected obstacles and can easily choose level of difficulty. Besides, the facilities such as bathroom is always just around the corner. No extreme weather conditions. If it’s cold or slippery outside, heading out by itself might be a dangerous thing. To avoid catching cold or slip and fall, gym environment is the best choice. No danger of running in the dark. If you have a day job, sometimes it’s hard to make time for running, and only evenings are left to practice your activity. Running in the dark and / or in dangerous neighborhoods will be avoided in the safer gym atmosphere. People who have social anxiety or enjoy more solitary activities often find that running outside – especially in the nature – allows them to feel safer from (real or perceived) competitiveness of the gym. All in all, from most points of view gym environment is safer. Physical exercise does so much more than get us in shape and give us strength. It provides (maybe even more importantly) great overall feeling and releases endorphins. So, which option to choose if you’re looking to have more fun: running on treadmill or on the road? Easier to coordinate if you want to exercise with friends. If you prefer to work out with friends, coworkers or your partner, a gym is a better place to meet. Nobody will fall behind and you can shower just after the workout instead of waiting till you get your respective homes. Working out together is fun and boosts motivation! Changing scenery. Many people feel that treadmill experience might be compared to a place where time doesn’t move. And outside you will always have something to focus your attention on. Vitamin D. On a sunny day you’ll get all that precious vitamin we all need. Just don’t forget to wear sunscreen and be properly hydrated if the sun is too hot! Fresh air is something most of us feel lacking – working in the offices, staying at home, traveling by car… To have a run outdoors will get you that wonderful, fresh feeling that gym will never be able to provide. Where the general mood is concerned, most people find that running outdoors is much better. Everyone has different expectations and different demands. So the solution to the dilemma “treadmill versus running outside” remains an individual choice: one is safer, another provides better mood and more health benefits.